Milbro was an old English firm who provided papers printed to represent sides etc for adding to rolling stock. Here are two Hornby wagon bases with wooden sides & ends added with Milbro papers glued on. Loads shown are Luke Adams bricks. 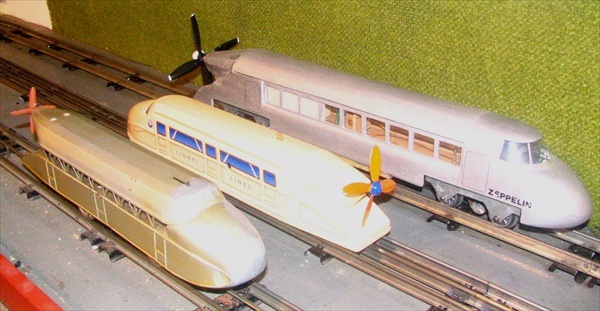 Below - Hornby Dublo trains were made from 1938 until 1964. 00 gauge (16.5mm between outer rails) These are 3 rail trains, towards the end of production 2 rail trains were made. 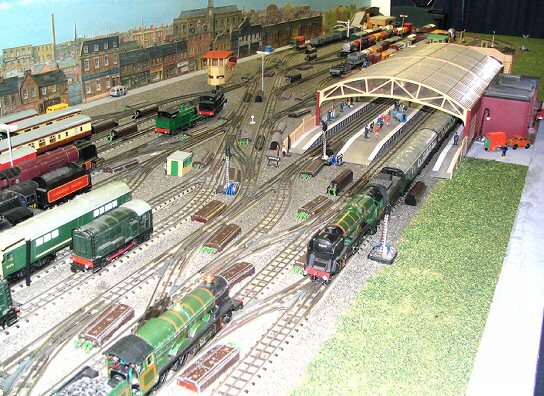 These photographs were taken an extensive 3-rail layout. Four Hornby Dublo LNER A4 locomotives. The two at the left are prewar, one of these is clockwork powered. The other two are postwar (more of the driving wheels are exposed to view). Station yard scene with canopy passenger station. 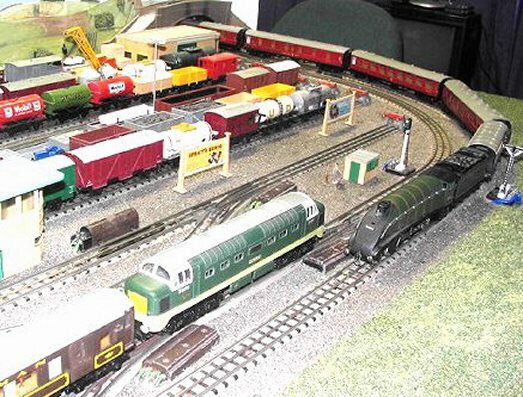 Hornby Dublo `Deltic` diesel at centre and an A4 steam type loco at right. The French Meccano factory also made 00 gauge trains under the Hornby ACHO name. 00 gauge is 16.5mm between outer rails, This is known as H0 gauge in the USA & elsewhere. Publicity brochure supplied to Meccano & Hornby dealers, showing the dealer`s name. The items shown are from the early 1920s. 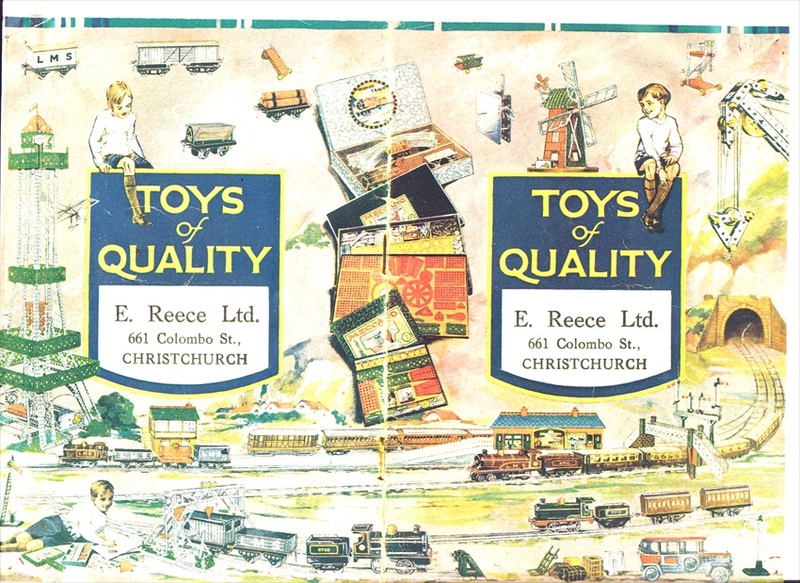 E. Reece Ltd. existed until about 20 years ago. It was a shop I did visit occasionally but I don`t recall much in the Meccano/Hornby line after WW2. The Kruckenberg `Zeppelin` was propelled by an aircraft motor turning an airscrew. Only was built. Impractical for normal use, but set a rail world speed record that stood for 20 or so years. At left is an early Marklin clockwork 0 gauge model, than a modern Schylling version, and at right a homemade item that is actually propelled by the spinning airscrew and not by a motor driving the wheels. 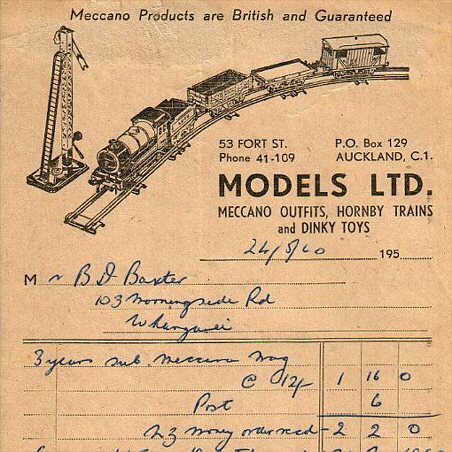 Models Ltd were the New Zealand importers of Hornby and Meccano. Here is a statement showing that Bruce Baxter was a subscriber to the Meccano magazine. Bruce was an authority on the subject of Hornby Trains. Meccano Ltd had a factory in New Jersey, USA, in the 1920s. Later in the period clockwork trains were introduced. These were not the same as English Hornbys. However production was brief and they are now scarce collector`s items. After the Meccano American factory closed production of the rolling stock continued in the 1930s in England. But not the locomotive! This a homemade representation of the American loco as seen above. A Hafner body was modified to make it more like the American locomotive. A 12 volt motor was fitted. The tender is a Hachette which was virtually the same. .Hornby clockwork powered electric style locomotive, 1930s vintage. Also a small homemade loco powered by a Hornby M0 clockwork motor. Lionel advertisement from the 1920s. A Lionel train on a Meccano bridge. In those days there was a connection between Meccano Ltd and Lionel. Lionel had a financial interest in the USA Meccano factory. Meccano USA had a factory in Elizabeth, New Jersey, Lionel`s factory was a few miles away in Irvington. In the late 1920s Meccano gave up its American enterprise.